I really had to get involved with this one. I really had no right to let it go past. 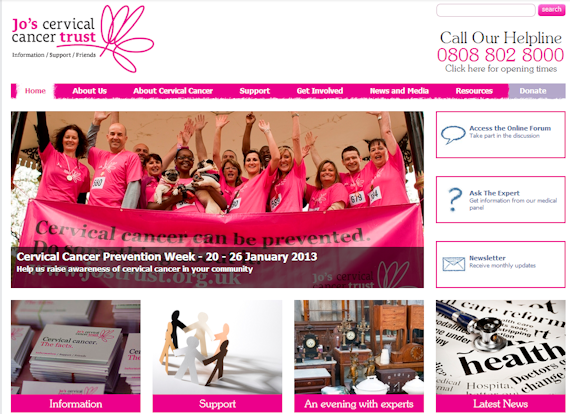 I’m not going to go in detail with the symptoms of cervical cancer as this is prevention week, but if you want to find out more about what could indicate cervical cancer, please head on over to Jo’s Cervical Cancer Trust. Twenty years ago (yes, I am that old) I finally went for my first smear. I’d put it off as I had severe endometriosis and pain was often so incredible that I couldn’t touch my stomach from the outside, let alone have something shoved up my inside. I watched a programme which put the fear of death into me and decided I’d have a try. Two nurses, a doctor, and yes, a lot of pain later, they finally got my smear. With the endometriosis damaging my cervix, they couldn’t even see it. It came back with severe abnormal cells – Cin 3. Another year and I probably wouldn’t have been here today. I was lucky. After a few weeks nervous wait to see if it was confirmed, it was on to the laser treatment, which was not as bad as I thought it would be, but then again, I think they inject enough freeze into the cervix to stun an elephant. The injection to freeze is a little like the dentist freezing the roof of your mouth, but just a bit more stingy. Thankfully, after that, there was no pain. The burning smell is not too clever though, and does make you realise that they really are burning off the bad cells. I really want to take the mothers who persuade their kids not to have the vaccination and shake their shoulders. How stupidly silly can they be? A simple vaccination and their daughters are protected. Do they really want their daughters to go through the nightmare of results, re-smear, laser treatment and then the constant smears afterwards to make sure it hasn’t crept back? Do they really want their daughters to risk cervical cancer? Why are they not persuading their daughters to do it? There’s nothing “seedy” about it. Most cervical cancers are caused by a common virus – (HPV) human papilloma virus. Some women are susceptible to it, and others are not. Changes can show as abnormalities of the cells of the cervix and when they become severe, they can develop into cancer. Cervical screening detects early changes in cells, and although the vaccination for HPV can only prevent infection from two of the 20 highest risk strains, to me, it’s not worth the risk of not taking it. Far too many girls and women are not getting screened when they are at the age to be screened. I wish they would screen every girl from the year she begins to become sexually active, but sadly, that is never going to be the case. The UK scheme offers girls the vaccination programme from age 12 – 18. If I had girls, I’d be beating down the door of anywhere that they could get the vaccination done. The choice for me would be simple – an injection into the arm to reduce the potential of having the stress of tests or nether regions burned by a laser, or even worse – living and fighting cervical cancer. Vaccines are given by injection into the muscle, usually the upper arm. Three separate doses are needed. The second does is given one or two months and six months after the first dose. It’s not a guarantee, but it removes a high factor of the risk. A lovely and very young lady who used to be on Twitter had advanced cervical cancer. She was pilloried, given a hard time and abused to the point of having to leave. Those of us who used to chat to her, miss her. She was hounded and treated like rubbish by other women. There is absolutely NOTHING to be ashamed of in having pre-cancerous cells or cervical cancer. The time between smears, and the age of screening means that at times, it may be too far advanced before abnormal cells get picked up, even if women have had all their smears. Get your smears on time and get the vaccination if you are eligible for it. Your life may just depend on it. I allowed them to make their own decision – neither are needle phobic. Both decided at that time not to have the injection. My Mum was offered the thalidomide drug when pregnant with me. She refused it – I am eternally grateful to her for refusing it at a time when side effects were unknown. It’s a hard decision sometimes to make. I think almost everything has a dark side posted somewhere. I know I wouldn’t hesitate now, but I’d research which of the vaccines were used. I’d prefer it if the girls who said no got their smears started earlier, but everything is down to cost isn’t it? I’m hearing some mothers are persuading their kids against using it as a form of prevention for possible STD scare, thinking that their daughters would be so scared of catching it, that they’d just abstain. For that reason, it’s just silly.